Rounds 3, 4 and 5 of our Dinghy Regatta take place on 5 November. Skippers at 12h00 and first race not before 13h00. 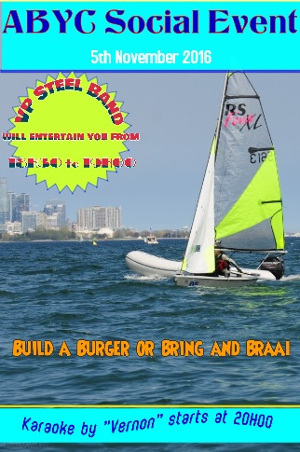 At 15h00 the Victoria Park Steel Band, parents and teachers will be taken to view the racing on Malgas, Warrior and Wallbanger and return to moorings at around 17h30. The Victoria Park Steel Band will then play from 18h30 to 19h00 (or until the encores cease!) and again from 19h30 to 20h00. This promises to be a very entertaining event and incorporates a bring and braai for all visitors and sailors. ABYC will provide the braai fires – thanks Mike, Robbie and Ken. Those of us with good (or bad) singing voices can then take part in the Karaoke by Vernon from 20h00 until late.